Given: The graph below shows the number of movie tickets sold around the world each year from 1980 to 2010. Ticket sales, according to genre, are presented in millions. The line graph presented illustrates the sum of money, in millions, spent on movie tickets, from 1980 to 2010. The movie ticket sales are grouped according to movie type. The movie types include comedy, action/adventure, documentary, horror, and comedy. 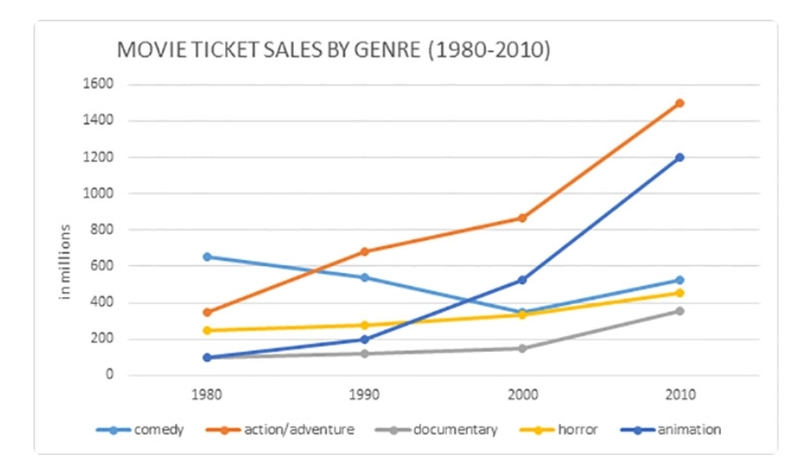 Overall, the sales, with respect to most of the movie types, have increased over the past 20 years. The sales of comedy movie tickets failed to follow this trend, as they presented an overall drop in sales. Past the year 2000, the action/adventure and animation movie tickets showcase the steepest increase in sales. In terms of sales, action/adventure and animation movies yielded the most in the year 2010 (around 1500 million and 1200 million respectively). Documenary and horror movies also presented an increase in sales however, at a much steady pace. On the other hand, the sales of comedy movie tickets were gradually dropping from the year 1980 till 2000. In 2010, there was a rebound (from around 390 million to around 590 million). Nonetheless, this rebound in sales was still less than the sales generated in 1980 (around 620 million). ps. I would really appreciate a rough band score. This is my first attempt and I would like to see were I stand. Serena, you could probably score around a 6 in the official band score for this test. Your presentation is clear but constantly in summary rather than reporting form. Your clarity is acceptable except when you indicate information a parenthesis for 2 different items in the report. I tis best to use the given numerical information at all times because an analytical report essay relies heavily on the factual numerical data given by the original report. Summary reporting does not effectively work in a Task 1 essay. You must make sure that you are constantly double checking the information you are presenting. Be factually accurate and take note of minute / minor details such as the overlapping instances in the graph. This refers to the "comparisons" part of the instruction When certain parts of the graph overlap, that means, there is similar information shared by the graph and this should be reported in the analysis as well. Doing so indicates that you took the time to truly compare and contrast the information given. Overall, good work. You wrote enough words to be above the minimum word count and, more importantly, you have enough simple and complex sentences presented in the essay. You need to improve your vocabulary use but I would not worry about it so much because the mistakes in that area don't really affect the meaning of the sentence nor change the topic of the paragraph. Good job. Keep it up. I know you will do very well. in the actual test. Thank you so much. I will be attempting another writing section soon. Hopefully your advice will help me improve my band score.